You can drop-off your equipment at our centrally-located Raleigh office for service, then pick it up once service is completed (usually 3-5 business days; sometimes quicker). Click here for our office location and office hours. Call or text us at 919-841-5506 or click here to complete our online Service Request form before you come to speed up the drop-off process. We do offer both "Rush Service" and "Emergency Service" for an additional charge. We can also pick up your equipment at your location and return it to you after service is completed for a small additional charge (click here for details). And we offer on-site service where we perform service at your location (click here for details). The following special $75 flat-rate charges apply to all Drop-Off Service customers and are applied per device serviced. Please note that these rates do not include any parts charges (which will be extra if provided by Tech Wizards). These rates do not apply to business customers or servers. Diagnostics - Includes written insurance estimates. This charge does not apply in cases where repairs are authorized to be performed while the computer is in our shop for diagnostics. Password Reset - Applies to Windows or BIOS password resets. In the rare event that technical limitations prevent us from resetting your password then only a $50 minimum charge will apply. RAM Memory upgrade - Does not apply in cases where laptop disassembly is required. Internal components - Includes power supplies, drives, add-on cards, and desktop PC case fans. Laptop Keyboard Replacement - Applies only when keyboard is easily accessible (which most, but not all, are). We do not charge for "wait time" incurred during in-shop service for things like scanning for viruses, transferring files, downloading and installing installation files or Windows updates, etc.). You only pay for the technician's "hands on" bench time, which can often significantly reduce your total labor charge. Labor: $33 per quarter hour with a $99 minimum charge. Maximum labor charge for a single issue repair: 3 hours (except if an OS reinstall is required). In-Shop Rush Service/Emergency Service Fee: $50 - Applies only if we have to bump other in-shop repair jobs in order to put you at the "head of the line" for service. Additional $50 charge applies if technician must work beyond normal business hours to get your computer back to you ASAP. To save time when dropping off your equipment, please complete our Online Service Request form (click here), or call or text us at 919-841-5506 to arrange a time to drop-off your equipment (you can provide needed information during the phone call, or when you drop off your equipment. When you drop off your equipment, a $50 deposit (cash, check, or credit/debit card) will be required unless you have been pre-approved for invoicing or you are a Service Agreement customer. The full amount of this deposit will be applied to your total labor charge. When you drop off your equipment you will be given a receipt listing the equipment you dropped off and the amount of the deposit you paid. Your Tech Wizards technician will contact you after diagnosing the problem with your equipment to discuss the service needed to resolve the issue(s) unless specific service instructions were provided by you, negating the need for a phone call at this point. Your technician will then call, text, or email you when service has been completed to let you know the total repair charge and arrange a time for you to pick up your equipment, at which point full payment (minus the deposit you paid at the time of equipment drop-off) will be collected (cash, check or credit/debit card). Please remember that our office is currently open BY APPOINTMENT ONLY, so be sure to call or text us at 919 841-5506 before you come unless you have already scheduled a specific drop-off time with us. Drop-Off Service is usually less expensive than our On-Site Service (where we come to you), but it usually means that you are without the computer for a bit longer since our average In-Shop Service turnaround time is usually 3-5 business days (sometimes quicker) while we can often provide onsite service "same day" or "next day". Our Pick-Up/Delivery Service saves you money because unlike with on-site service, you do not pay for "wait time" while scans, diagnostics, or other processes run. You only pay for the technician's "hands on" bench time, which can often significantly reduce your total labor charge. For an additional $20 charge, we will come to your location and pick up your computer, take it to our repair shop for service, then drop it off back at your location when service has been completed. This assumes that you disconnect all cables before we pick up your computer and reconnect them after we drop off your computer. If you want us to disconnect and reconnect the cables and power up your computer after service to demonstrate that service was completed successfully then a $33 per quarter hour charge (with a quarter hour minimum) will be added to your labor repair charge to cover the time the technician spends on-site at your location. 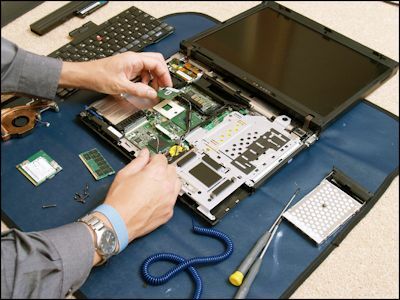 Call us at 919-841-5506 to arrange Pickup/Delivery repair service.